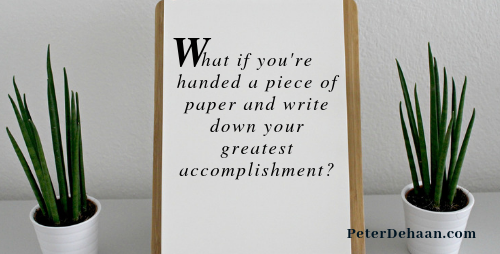 HomeBlogSpiritualityWhat is Your Greatest Accomplishment? At church a few weeks ago we were asked a question, “What is your greatest accomplishment?” We were supposed to write it down on a piece of paper. As a writer you would think I would be good at such things, but since I do all my writing in solitude, with as few distractions as possible, I have great trouble coming up with anything to write when in a public setting. Focus alludes me, and any words that do tumble forth seem woefully inadequate. As I ponder this question, other people quickly scribble down their answers. Gee this is hard to decide. I have many notable accomplishments, but none seem truly great. As I try to determine which of my good-but-not-really-great accomplishments rise above the others, I start thinking outside the box. I sometimes do this, often to the dismay of others. My greatest accomplishment is still to come. That is true; I am optimistic about the future. I have no doubt that God has amazing things in store for me. In complete confidence I know my future will surpass my past. How cool is that? Should I write that down? If they read our answers will people think I’m snarky or even arrogant? Then I remember the setting. This is church after all. I should think of a spiritual answer. Then truth hits me. It is clear and pure, without false modesty or feigned piety. I have accomplished nothing; Jesus has done it all. Still I hesitate to write. I try to figure out why they are asking this. While still in the middle of this exercise, I’m trying to anticipate the endgame. I don’t want to call attention to myself; I don’t function well in the spotlight. Frozen in indecision, my hand won’t move. Our leader tells us to bring our accomplishments forward. She holds up a trashcan, presumably the only handy receptacle. Others spring forward to offer their greatest accomplishments. I hesitate. I want to participate as instructed, not be the maverick who doesn’t follow instructions. Reluctantly I circle back to the beginning. What is my best accomplishment to date? Nothing comes to me; my mind goes back to God. He deserves all the credit. How would you have answered this question? Does God view our accomplishments as garbage? Not sure I understand what she meant BUT….. My greatest accomplishment so far is my adoption work. I’ve had a hand in more than 50 reunions now. Needing to get back at it. Concentrating on taking care of ME right now so I can be here. Finally got on the kidney transplant list. Mary, thanks for stopping by. Fifty reunions is amazing! I’m glad you’re also taking care of yourself, too! I feel your dilemma! I had a similar experience at the writing conference, “Quit Whining, Start Writing.” Just for fun, I thought I’d take the class “Broccoli and Boogers.” Huge mistake. A class on writing for children, one of the exercises was to write about a favorite, happy childhood memory. The sound of pens furiously writing on paper roared in my ears compared to my own, which (at least to me,) was conspicuously silent. Not wanting to attract attention, I began to scribble/doodle write just to blend in. I had nothing. At least you were honest! (BTW, my take away from the class was learning the difference between broccoli and boogers. Kids won’t eat broccoli!) Sheesh! We must be kindred spirits; I can seldom write when others are present. I’m so glad you did!